HP has cut down the price of its already affordable Slate 7 down by $30, making it probably the most affordable brand-name tablet out there. The HP Slate 7 8GB now costs $140 down from its original $170 price, while the 16GB version of the tablet is now priced at $170. 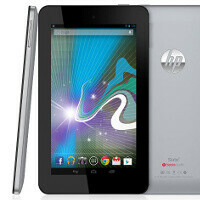 The HP Slate 7 is a neat little 7-inch Android tablet. It has got a solid build quality and comes in the rare for a tablet and distinct red color. The device is powered by a dual-core 1.6GHz chip, 1GB of RAM and runs on Android 4.1 Jelly Bean. If we had to pick the nits, we’d mention its low-res 1024 x 600 pixel screen as a drawback, but then again it’s a $140 tablet. If you are looking for the best deal on a 7 incher right now, that’s probably it. You can get the discounted HP Slate 7 on both HP’s website and on Best Buy. And yet...no one wants it! In other news, NewEgg has just put the Nexus 7 32 GB for sale at $199. This can only mean one thing: NewEgg is cleaning out their inventory of Nexus 7's. Why? Because the new Nexus 7 is coming... I'm surprised no one else has been talking about this.